PCGamer - 93 - "Sight, sound and systems harmonize to make Civilization 6 the liveliest, most engrossing, most rewarding, most challenging 4X in any corner of the earth." PCGamesN - 9/10 - "It's just the beginning of a new Civ Chapter, and what a glorious, confident beginning it is." Telegraph - 100 - "Civilization 6 is not just a great strategy game - it's a remarkable comeback." We've had the pleasure of playing Civ 6 for a few hours already, although I wish we had more. 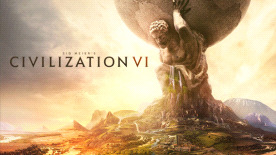 Each match of Civilization 6 will take you hours to complete, but not without good reason, the new improvements in improving city tiles, diplomacy and more make Civilization VI fresh enough to make us want to play this game for hundreds of hours. You can guide your Civilization from being spear-wielding warriors to high-tech, advanced troopers. Combat not really your style? Why not build your Civilization around culture, and be the most cosmopolitan country in the world! There's so much to Civilization VI, and it's going to last you a long, long time. Getting into games with friends will be sure to ruin some relationships along the way- and that's just a testament to how incredible this game is. This product has Steam activation region restrictions in place. Please ensure that your GreenMan Gaming account registration details match your Steam account registration details before purchasing, or your game may not activate correctly in your region.